This iniquitous Bill refuses to die. It keeps re-emerging like a Godzilla sequel; forever coming back like the proverbial bad penny – unwanted, unpleasant, unfortunate. We are told that the law as it stands is cruel; condemning, as it does, thousands of people to pain and needless suffering. This Bill will end the trauma: it foreshortens the unbearable life; casting the burden onto eternity. But it isn’t true. This Bill is not compassionate, kind or merciful: in fact, it’s a bunny-boiler of a bill, designed, as it proclaims, “to enable competent adults who are terminally ill to choose to be provided with medically supervised assistance to end their own life” – that is, to oblige doctors to play God, not only in determining absolute life expectancy, but in furnishing the deadly poison and assembling the mechanisms of death. Who judges competence? Two doctors will certify – as required for abortion – but that will soon become a routine bit of rubber-stamping, just as it is for abortion. The final decision will be made by a judge in a court of law, and he or she will hear testimonies and weigh the evidence. The doctors will make recommendations, but the judge will decide. Another layer of objective officialdom to reassure the sceptics. Aren’t suicidal thoughts a symptom of depression? Doesn’t the autonomous choice of the “competent adults who are terminally ill” become a statutory obligation upon those whose vocation it is – and has been since the time of Hippocrates – to heal, restore and rehabilitate? “Nor shall any man’s entreaty prevail upon me to administer poison to anyone”, said the original Hippocratic Oath. 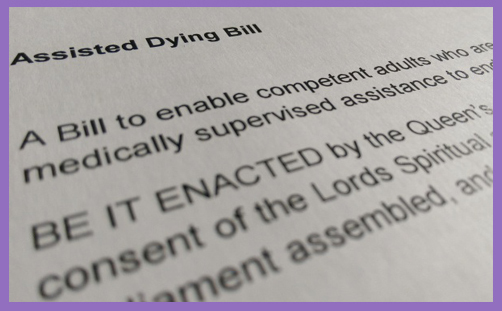 Yet Section 4 of The Assisted Dying (No.2) Bill requires doctors (and authorised nurses) to “prepare that medicine”, “prepare a medical device” and “assist that person to ingest or otherwise self-administer”. And then they have to hang around until the suicide has given up the ghost, presumably to bear witness to the devoutly-wished consummation. Will the courts be able to order a doctor to assist with the ending of a life if that doctor has doubts about the dignity, morality or propriety of administering lethal drugs? The Assisted Dying (No. 2) Bill is sponsored by Labour backbencher Rob Marris. It is, in substance, form and purpose, absolutely no different from Lord Falconer’s bills in the House of Lords (2013-14; 2014-15; 2015-16), which were based on the system of assisted suicide established in the U.S. States of Oregon and Washington. And that’s going well. “But we need the debate,” cry the Bill’s proponents, seemingly unable to accept that we have the debate every year, and every year they lose. And so the Bill springs back, and must keep on doing so until the law is changed. I do wonder where those who make that last demand have been for the past 20 years because we’ve repeatedly had the debate in public, in the media, and importantly, several times in Parliament. Let’s be honest. It’s not just a wish to ‘have the debate’ is it? It’s really a determination to get it legalised. The Bill’s content has been made known rather late in the day – the Parliamentary debate (Second Reading scheduled for September 11th, when the world is rather distracted with.. O, never mind) is already brewing: it is liberty, individuality, progress and rationality versus those of you whom Canon Rosie Harper simply judges “personally are requiring other people to judge extreme agony on behalf of your own conscience”, which, she avers, is “neither moral nor Christian”. That’s all there is to it. None is harmed: there is no thin-end-of-the-wedge; no slippery slope; no chain reaction. The Bill has been drafted by Dignity in Dying (formerly the Voluntary Euthanasia Society), so it can be trusted implicitly. To oppose it is immoral and un-Christian. Yet it is interesting how euthanasia morphed into assisted suicide, which has itself transmuted to assisted dying. Why not just call it the ‘collaborative furtherance of peace’ and have done with it? Since all that lives must die, who can argue against a warm, tender helping hand to aid us toward cessation? This Bill is profoundly dangerous, and if passed would compromise public safety and the welfare of vulnerable people. Whilst being presented as a very limited proposal, it runs the risk not only of ending the lives of people who, wrongly prognosed, could have lived far longer and happier lives, but of creating a situation whereby vulnerable people are subjected to subtle pressure by unscrupulous relatives or medical staff who wish to empty a bed. Others might simply by cultural inertia choose to end their lives because they feel a burden on others, as did 40% of those choosing to die in Oregon, and 59% of those choosing to die in Washington, according to the most recent figures. All of these situations would far more often than not be undetectable by the paper-thin ‘safeguards’ given in the Bill, which constitute little more than a toothless procedural checklist. In establishing the principle that there is a ‘right’ to be assisted in killing oneself, Marris’s assisted suicide Bill would establish the ground for incremental extension of assisted suicide to others beyond terminal illness, and the introduction of euthanasia for others who are rendered incapable of killing themselves. That is why it is opposed by elderly and disabled groups such as the British Geriatric Society, Scope, Disability Rights UK and Not Dead Yet UK. It is also opposed by leading medical organisations such as the Royal Societies of Physicians and General Practitioners, the British Medical Association and the World Medical Association. The vote in the House of Commons will be a close one, so every vote will count. The Prime Minister himself is opposed to any change in the law, but he has the slenderest of majorities and is somewhat preoccupied. He does, however, care deeply about the disabled, vulnerable and terminally depressed. His father was born with both legs deformed, and his son was born with cerebral palsy and suffered from epilepsy. A politician’s quality of life would be greatly enhanced without having to endure either burden. Do we really want to live in a brave new world where it is left to lawyers in ‘suicide courts’ to eradicate all ‘unnecessary suffering’?